Even after brutally going through and recycling there were still lots of stuff we 'had to keep'. I made a decision this weekend to see if I could transition my household to be largely paperless. My purchase was a Fujitsu SnapScan s1500m -- I've seen Fujitsu at Mac world for several years and while I've always kind of liked the idea the price (~$404 at Amazon) was always more than I wanted to pay. That changed when I spent almost an hour trying to scan in documents with my trusty HP all in one. 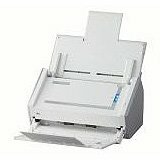 The HP is fine for a few items but for any kind of volume it's pretty horrible -- It's slow and can't reliably feed more than a few sheets at a time. I'll report back in a few weeks on how things are going..